From here you can manage all data for Pinpoint Booking System. Link 1 - Link to plugin documentation. Button 2 - Select administration area language. Item 3 - Dashboard: check if you meet the minimum requirements. Item 4 - Calendars: create and manage calendars. Item 5 - Locations: manage your locations. Item 6 - Search: create and manage the search function. Item 7 - Reservations: approve or cancel reservations; create reservations yourself or print the ones you already have. Item 8 - Rules: create the rules that you want to add to your calendars. Item 9 - Extras: create and manage Extras, amenities and services you want to add to each calendar. Item 10 - Discounts: create and manage discounts you attach to your calendars. Item 11 - Taxes & Fees: create and manage the taxes and fees. Item 12 - Coupons: create and manage coupons you want to add to your calendars. Item 13 - Forms: create, manage and translate the form you add to each calendar. Item 14 - Email templates: create, manage and translate the emails you send. Item 15 - Translation: manage the languages and add your translations or change the phrasing to your taste. Item 16 - Settings: activate your licence and give set user permissions. Item 17 - Tools: use basic tools to repair calendar settings and database & text. 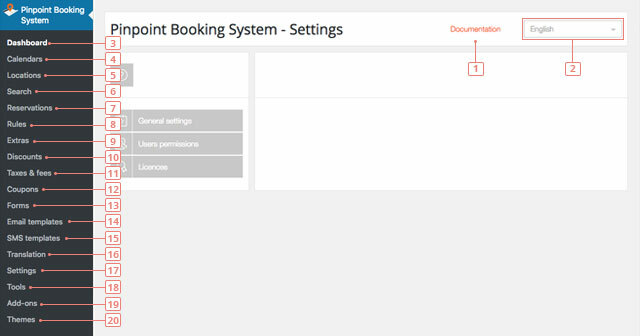 Item 18 - Add-ons: view the currently available Add-ons for Pinpoint Booking System.